Rattner, who co-founded private equity firm Quadrangle Group LLC, most recently has been promoting his book, called "Overhaul," about the auto industry. WASHINGTON (Bloomberg) -- Former Obama administration car czar Steven Rattner, the subject of state and federal investigations related to corruption at New York state's pension fund, is near a settlement with the U.S. Securities and Exchange Commission, according to a person familiar with the matter. The proposed accord includes a two-year ban from the financial industry and a $6 million fine, according to the person, who declined to be identified because the talks are private. In June, the SEC proposed a three-year ban, while Rattner suggested one to two years, a person with knowledge of those negotiations said at the time. Rattner, 58, co-founded Quadrangle Group LLC, a New York-based private equity firm, in 2000. 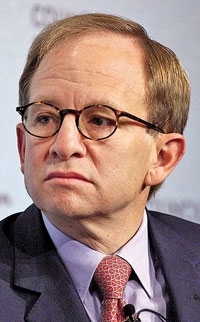 Rattner left the firm and served the Obama Administration's Treasury Department as chief adviser on auto-industry restructuring from February through July 2009. Rattner arranged to retain Henry “Hank” Morris, the former chief political consultant to ex-New York Comptroller Alan Hevesi, as a placement agent and paid him more than $1 million in sham “finder” fees, according to the SEC and New York Attorney General Andrew Cuomo. Rattner also is accused of setting up a DVD distribution deal for a movie produced by the brother of a pension fund official. In exchange, Quadrangle obtained $100 million in investment commitments from the New York state Common Retirement Fund, said Cuomo, who resolved a probe of the firm in April for $7 million. Quadrangle also settled with the SEC that month, agreeing to pay $5 million. The firm neither admitted nor denied any wrongdoing. The SEC postponed a vote on the proposed settlement that was scheduled for today, according to a person familiar with the matter who declined to be identified because it wasn't public. Asked about a possible New York settlement with Rattner, Cuomo spokesman Richard Bamberger said earlier today that it was an “ongoing matter,” declining further comment. Rattner counsel Jamie Gorelick didn't return calls for comment on the possible SEC settlement. John Nester, a SEC spokesman, declined to comment. Hevesi, 69, pleaded guilty last week to participating in the so-called pay-to-play scandal at the pension fund, which he once ran. Hevesi was the highest-ranking official convicted in a three-year investigation by Cuomo, the Democratic candidate for governor of New York. Morris is awaiting trial on charges he corrupted the investment process to benefit money managers who made campaign contributions and politically connected placement agents who received lucrative fees, including himself. At least six other people besides Hevesi have pleaded guilty in connection with the New York probe, 15 firms besides Quadrangle have settled and more than $139 million has been paid to the fund and the state, according to Cuomo. Rattner is identified as a “Quadrangle executive” in the SEC's April 15 complaint against the firm, and by name in the settlement agreement with Cuomo. In 2003, Quadrangle tried to meet with David Loglisci, then head of alternative investments at the New York pension fund, and got a call from Morris and agreed to meet with him, according to the New York agreement. At a Dec. 2, 2003, meeting, Morris told Rattner he was helping investment firms raise private-equity money from pension funds in New York and California, the agreement said. Morris asked Rattner to help Steve Loglisci, brother of the pension fund official, arrange distribution for his movie, “Chooch.” Rattner agreed, according to the settlement. On Jan. 10, 2005, Quadrangle formally retained Searle & Co., the broker-dealer Morris was associated with, as its placement agent for the New York state retirement fund and six other pension funds, including funds in California, Florida, and New Mexico, the agreement said. Searle would be paid 1.1 percent of investments by the funds, and 0.4 percent of any amount over $75 million, excluding the first $25 million New York state commitment. Morris provided no legitimate placement-agent services for Quadrangle with the New York state retirement fund, according to the New York findings. In January 2005, Rattner told Morris that Good Times Entertainment, a Quadrangle portfolio company where he sat on the board, would do a DVD distribution deal for “Chooch,” Cuomo said. Two weeks later, the pension fund recommended a $100 million investment in Quadrangle, a commitment formalized that March. Searle received $1.12 million in fees from October 2005 to June 2007 for the New York state deal, and paid more than $1 million to PB Placement LLC, an entity controlled by Morris, the agreement said. Searle also got $1.27 million in fees from Quadrangle related to New York City pension funds, which invested $85 million in the firm, according to the New York settlement. Those fees were paid between March 2006 and July 2007. In addition, Searle received placement fees stemming from pension-fund commitments to Quadrangle in Los Angeles. Campaign contributions also came into play. According to the agreement, when Hevesi was running for re-election, Morris called Rattner and told him other investment firms with New York state pension fund assets had donated to campaigns. Rattner responded that he had a policy against contributing to officials who oversaw state investments, according to Cuomo's findings. Morris told him he should contribute indirectly, and Rattner asked an unidentified Democratic donor to give to Hevesi, Cuomo said. The donor and his wife each gave $25,000 to Hevesi's re- election campaign, according to Cuomo. The New York state pension fund subsequently increased its investment with Quadrangle to $150 million from $100 million, he said. Hevesi who was elected state comptroller in 2002 and resigned in 2006, admitted Oct. 7 to a second-degree charge of receiving reward for official misconduct in New York State Supreme Court in Manhattan. Hevesi, also a Democrat, agreed to cooperate in Cuomo's probe and may avoid prison time. David Loglisci pleaded guilty in March for allowing Morris to choose which money managers received alternative investments from the pension fund. He also agreed to cooperate. Quadrangle Asset Management has handled the personal and philanthropic finances of New York Mayor Michael R. Bloomberg, whom Rattner supported through his chairmanship of Democrats for Bloomberg during the 2005 re-election campaign. Bloomberg is the majority owner of Bloomberg LP, the parent of Bloomberg News.